I’ve never felt the need to apologise for not blogging or to make excuses for long breaks between updates. I find posts like that rather dull. I will say, however, in the time since my last post I’ve been sunning it up in Hawaii. Sun, sand, shopping and sleeping – no baking. A little crafting. Lots of eating. While in Hawaii, we ate the American foods we love, like dinners at The Cheesecake Factory and enjoyed (and over-indulged in) free soft drink refills. We also sampled local seafood which was delicious. As much as I love my home and family and friends it’s a bummer to be back in the real world. Take me back to the shore of Waikiki any time! 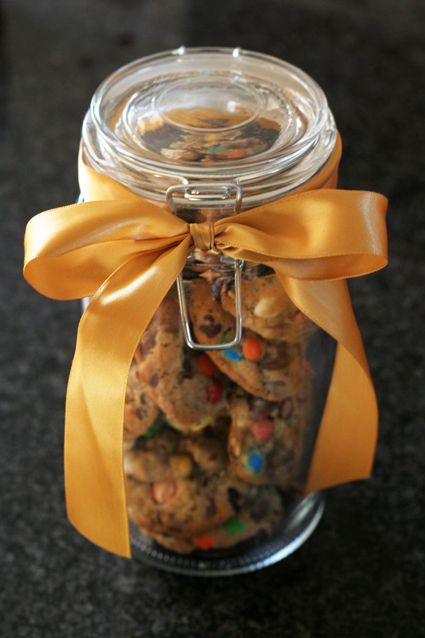 The first thing I baked after arriving home was kitchen sink cookies – half a gift for a friend’s fiance who recently broke his leg, and half for a friend’s birthday. What I didn’t know was while I was away said friend started a wheat-free diet. She tells me she made an exception for a kitchen sink cookie or two. Her four-year-old daughter declared me “the best cooker after you mummy”. High praise indeed! Hey Katie, we’ve just come back from three weeks in the US too and I agree it is sad to come back to the real world although I could do without the weight loss that comes with the holiday eating!! Hope you had a good time Kim!